A summer getaway for wealthy families in the late 19th and early 20th centuries, the Thousand Islands region continues to be a favorite vacation destination in upstate New York. Straddling the US–Canada border where the St. Lawrence River meets Lake Ontario, Thousand Islands shares the waters with the St. Lawrence Seaway, a series of locks and canals that allow ships to travel between the Atlantic Ocean and the Great Lakes. Despite the region’s name, there are actually 1,864 islands, from tiny private isles containing a single residence to larger islands open to the public with campgrounds, parks, cottage rentals, and more. Take a boat tour to see Gilded Age mansions and castles, intricate island geography, lighthouses, and other waterfront sights while learning about the history of the area from an onboard guide. Alexandria Bay, Clayton, and Sackets Harbor are some of the more popular towns to stay in or visit on the US side. If you’re interested in heritage and culture, check out the Cornwall Brothers Museum, Antique Boat Museum, or Thousand Islands Arts Center. If you wish to cross the border into Canada, you’ll need a passport or another approved form of documentation. This includes boat travel, although some boat tours do not require documentation if passengers are to stay on the boat for the duration of the tour. Wellesley Island is reachable by car on the Thousand Islands International Bridge, which connects the US to Canada. Wolfe, Howe, and Simcoe islands can be accessed by ferry. There are a number of New York state parks that offer camping, picnic spots, fishing, and other recreation. These include Waterson Point State Park, Wellesley Island State Park, and Keewaydin State Park. The town of Alexandria Bay is 350 miles (560 kilometers) north of Manhattan. If you’re arriving by road from New York destinations, travel times are about 90 minutes from Syracuse, 3.5 hours from Albany, four hours from Buffalo, and 6.5 hours from New York City. Summer is the high season, perfect for outdoor activities such as boat tours, fishing, and picnicking. Go in the winter for a quieter atmosphere and to see the beauty of islands covered in snow. 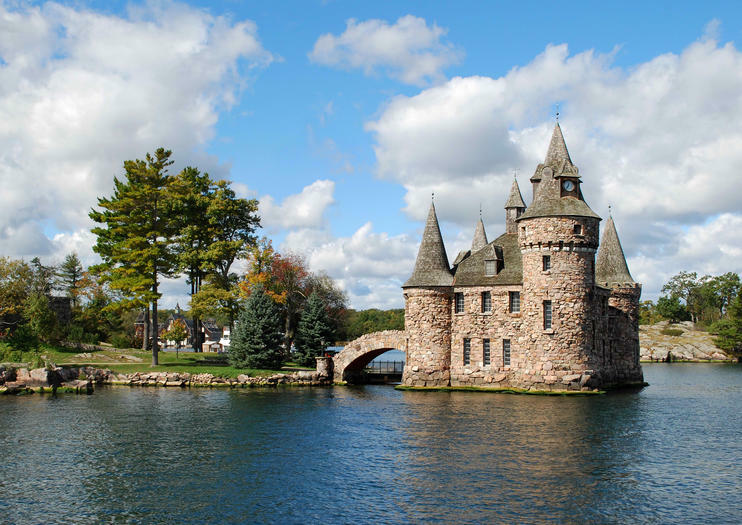 Located on Heart Island near Alexandria Bay, Boldt Castle is one of Thousand Islands’ top attractions. Commissioned in 1900 by George C. Boldt, the millionaire owner of Manhattan’s Waldorf Astoria Hotel, the 120-room, 6-story castle features tunnels, a drawbridge, and Italian gardens but was never used by the Boldts due to the sudden death of George’s wife. Today, it’s open to visitors from May through October. Oplev Niagara Falls på en problemfri todages tur fra Boston. Slap af på en bus, mens du rejser gennem New England-landskabet med transport- og opholdsudgifter inkluderet i en bekvem pakke. Besøg det ældste besatte militærsted i Nordamerika, nyd en bådtur på den historiske Maid of Mist, undre sig over Niagara Falls, og tur de tusind øer i Alexandria Bay uden stress for kørsel eller planlægning.